If the characters of “Tag” suffer a disconnect between reality and the fantasy world they have created through a game of tag begun in their adolescence and continuing through adulthood, so does director Jeff Tomsic’s film itself suffer a disconnect in tone. It’s never not a comedy, mind you, smartly, since I’m not sure how else you could evoke a lifelong game of tag graduating from the playground to corporate boardrooms. Yet if the film sometimes exudes a sentimental streak stressing the importance of friendship, as if trying to honor the real life game of tag on which the film is based, the actual scenes of the game are less cornily lo-fi, like the real life ones we see over the end credits, than fantastical, even occasionally jarringly intense. A golf course showdown evokes Walter Hill’s “Southern Comfort” (1981), as if their suburban ennui is manifesting itself as amateur war games, an intriguing tack the movie never completely takes. Indeed, a scene where, for convoluted reasons, our main characters threaten to waterboard a gym receptionist teases a bracing metaphor for the characters own sense of desperation, bringing the movie to the brink of genuine madness only to pull back and opt for a safe verbal punchline, becoming a metaphor for the movie’s own paralysis of identity. 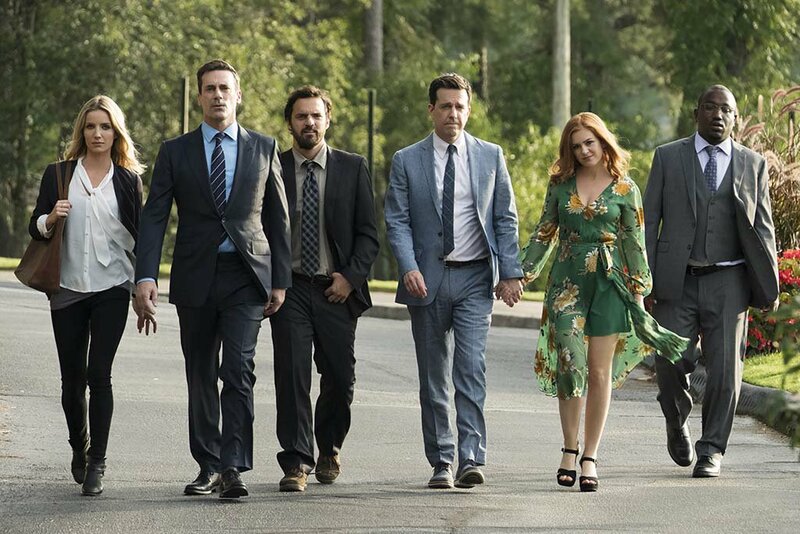 The opening scene, in which Hogan (Ed Helms), interviews for a janitorial job at an insurance company, might oddly excise its suspense due to the preceding prologue explaining straight away the game of tag and the absurd methods employed by these friends to make someone else “it”, but it also demonstrates how these characters frequently run up against the real world as the interviewer (Lil Rel Howery) incredulously struggles to comprehend Hogan’s objective. 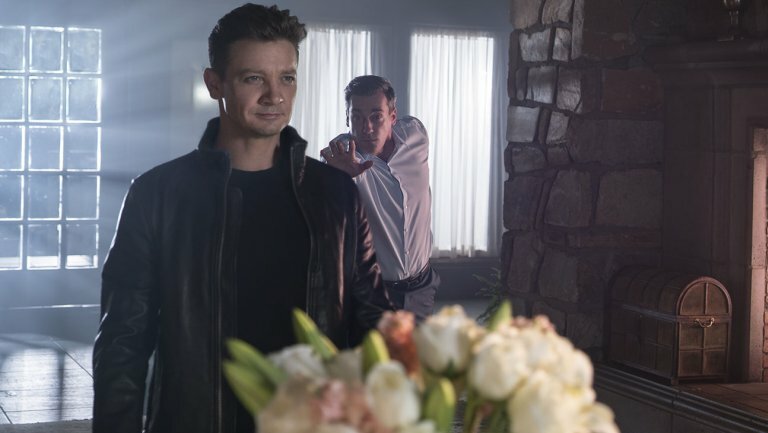 The objective, of course, is to tag his pal, Bob (Jon Hamm), the company CEO, and then pitch him a complex plan to tag their friend Jerry (Jeremy Renner), who has legendarily never been “it”, at his own wedding. Because Hogan tags Bob while the latter is being interviewed by a Wall Street reporter, Rebecca Crosby (Annabelle Wallis), she comes along for the ride, conveniently since the game’s exorbitant rules can be explained to her. You’re dying all movie to know what she thinks since she represents reality. But, expectedly, the movie does nothing with her, the editor sometimes forgetting she’s even there, and then remembering, catching glimpses of her stranded on the periphery with a dazed expression. Then again, “Tag” does not have much thought about its male characters either. Tomsic gets by on each actor’s inherent personality. Hamm is a smarmy guy in a suit. Helms is uptight and a little too earnest. Renner is cocky and a little aloof. Jake Johnson, as Randy, and Hannibal Buress, as Kevin, friends four and five, are, respectively, a pot-smoking slacker and rather chill but discerning. (Rashida Jones is here too, barely, and, as she will, floats above it all while side-eyeing everyone and everything.) All of them are generally funny in their individual ways, though the funniest thing in the movie is the slow motion mid-fight facial expressions, as if Tomsic took the opening to “Duplicity” as his action aesthetic inspiration. Buress, on the other hand, is just as funny in a more low-key way, and his laconic air and perplexed but pithy commentary emerges as the one element closest to breaking the movie’s code. In the golf course action sequence, where events spiral out of control, he says out loud how Jerry is a psychopath, which is so revelatory it almost has the feel of being improvised, as if Buress himself is stepping outside the movie in the moment and realizing exactly what’s going on. Isla Fisher, as Hogan’s wife Anna, is equals Burress but pitched at a more cacophonous scale, wildly swinging from nigh violent Tag-obsessed mania to sunny domesticity, showing Rebecca pictures of her kids with a bright, earnest smile, suggesting something akin to a split personality. Other bits of characterization, meanwhile, are mere flashes. Kevin is introduced in a therapy session, but his friends sneak in and forcibly remove him; Jerry is seen in AA meeting, but his friends invade to try and tag him. Over and over, these characters’ respective realities are not so much ignored in the name of old fashioned escapism as pointedly introduced and then trampled over in favor of the game. This group of friends came of age in the 90s, evoked in the soundtrack, a high time for virtual reality. And though the film might not be computer-generated, it frequently feels simulated anyway, as if even in the most important moments of their lives, these people remain plugged into tag.